Expiry vs. Expiration – What’s the Difference? Home » Expiry vs. Expiration – What’s the Difference? If you eat food past the expiration date, you will surely die. As it turns out, many expiration dates on food are arbitrary, and passing a quick olfactory and visual examination is a much more reliable indicator of food’s freshness than the date printed on its packaging. But what about an expiry date? Will you die of food poisoning if you eat Vegemite after it expires? Continue reading to learn more about expiration dates and expiry dates. 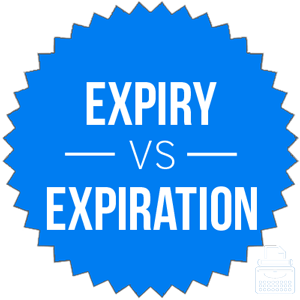 What is the Difference Between Expiry and Expiration? In this post, I will compare expiry vs. expiration. I will use each word in several example sentences, so you can see how it appears in context. Plus, I will show you a helpful memory tool that will make choosing either expiry or expiration much easier in your own writing. What does expiration mean? The word expiration is a noun that refers to death or something becoming bad or invalid. In this article, I will focus on the word’s use in the phrase expiration date. An expiration date is a date after which food is no longer safe to be eaten or sold. Expiration date might also apply to the point at which a contract or other agreement becomes invalid. In America, expiration dates are not mandatory for most food products, and their use is not regulated at the federal level. Some products, like dairy, meat, and eggs, are regulated at the state level. If you drink milk one day past its expiration date, you will probably not die. I have a loaf of bread that expired four months ago, but it still smells fine and is not moldy, so I occasionally eat a piece of it as a challenge to the gods. What does expiry mean? An expiry date is the date at which a product is no longer fit to be sold or eaten. It is primarily a British phrase. Unlike in America, expiry dates are mandatory for many products, and have been used since the 1970s. The expiry date on this Vegemite was thirty years ago! Expiry dates in Britain are like expiration dates in the United States. As you can see, American writers almost exclusively use the phrase expiration date, while the British use each phrase with much closer frequency. These charts aren’t exhaustive in their scope, since they only look at published books written in English since 1800, but they still paint a clear picture of a long-term usage trend. Use expiry with British audiences and expiration with American audiences. Since expiry contains a Y, like the British town of Surrey, it should be easy to remember this usage distinction. Is it expiration or expiry? Expiration has several meanings, but in the phrase expiration date it refers to a date after which food is no longer safe to sell or eat. Expiration is the American English standard. Expiry is primarily a British variant. The two phrases are otherwise interchangeable. 1 What is the Difference Between Expiry and Expiration? Founder vs. Flounder – What’s the Difference?